The March 6th lunch was focused on the Annual Adventures in Citizenship High School Speak-Off. The Organizing Committee for the Speak-Off consisted of : Tracey Hennessey (Chair), David Robbins, Enid Strickland, Norma Summers and Darlene Spracklin-Reid. The Judges for the event included Dr. Susan Caines, Victoria Barbour and Sonya Rideout. Three students participated: Benjamin Pollard (Waterford Valley High School); Marcus Furlong (Holy Trinity High School) and Anna James (St. Bonaventure’s College). A fourth student , Michael Chislett (O’Donel High School) was unable to attend the event. Judge Victoria Barbour presented the judges’ decision. She complimented each student on their presentation, noting strengths in each. 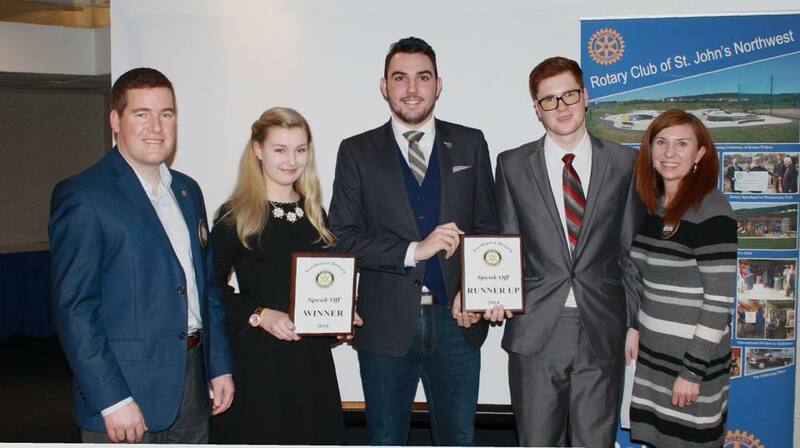 First place was awarded to Anna James; Benjamin Pollard and Marcus Furlong tied for runner-up. Patrick Breen, last year’s winner, sent a message of congratulations to all the participants in this year’s competition.